Except I’m playing Day 1b. So, today, apart from a couple of interviews and some PokerStars filming, I managed to be a good girl and stay in my room working on my book, the deadline of which is now TERRIFYINGLY NEAR. Or INEXCUSABLY LATE, depending on whether you’re asking me or the publisher. It felt incredibly glamorous, writing on the balcony of a Monte Carlo hotel. It made me think that if I had (a) six months to finish it and (b) 4 million euro to burn, I would write the whole thing here. I decided to take a picture of my impressive new working environment, to gaze at wistfully when I’m back typing in my smoky basement at home. 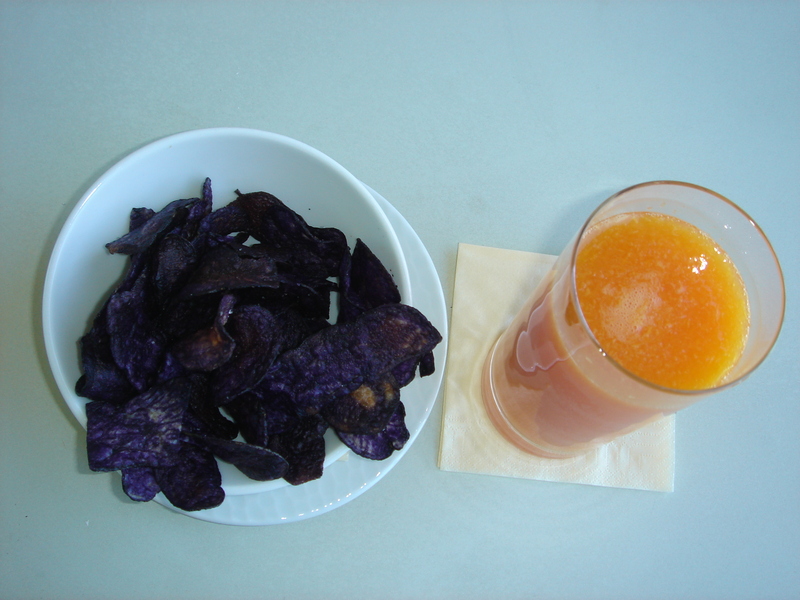 Then I took a picture of my lunch, which was some purple crisps and an orange juice. That seemed weird enough to document. It’s not what I ordered. (But it was about what I could afford - a sandwich on the room service menu is €22. That’s £19.50. Or $29. Or 2,788 Japanese yen.) And then I was going to take a nice third picture, of the Boatman brothers, because I met them for supper and it would prove I get out and about and have a life and everything. But I forgot. 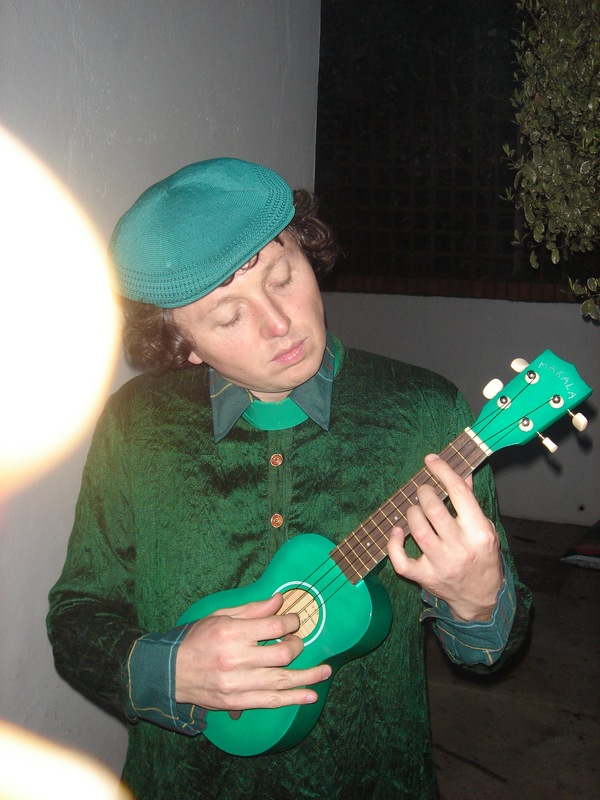 So the third picture is going to have to be an old one I found on the memory stick of my friend Charlie playing a tiny guitar. Charlie playing a tiny guitar. Naw, I’m still worried for you. I had these purple crisps once, on the side of a sandwich in a very posh hotel. Hmmm, lovely, but hardly a meal, come on! As a professional sports person (poker is a sport right?) you have to eat. Go all in. Enjoy your tweets, hope you don’t mind my ramblings? What’s the new book about? Good luck in the tournament today Vicky! i CAN`T WAIT TO READ IT! Pie and chips for my lunch!! Are they Silk Cut Ultras? You wuss. Picture number 1. Still smoking I see. It looks like last night’s Heresy only served to stir the rebel within. Picture number 2 only goes to illustrate what I’ve been saying for years, French cuisine is the most overrated in the world. Picture 3. Charlie’s writing is much funnier than his dress sense. Pic 3: That’s actually a ukulele (which means “jumping flea” in Hawaiian, fact fans) because it has four strings not six.